For this 2015 edition revised depths have been applied throughout. The Ría de Pontevedra TSS is now shown, as are the marina developments at Cabo de Cruz. Extensive changes throughout. 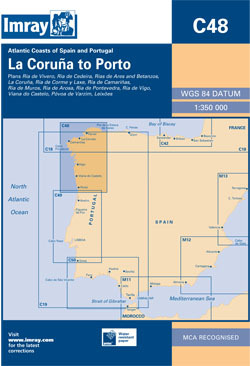 Includes revised depths in La Coruña, Ria de Corme y Laxe, Ria de Camariñas and Leixões; buoyage in Ria de Arosa fully updated, plus changes to prohibited areas in Viana do Castelo. The chart also has been reschemed to show better details in the Rías, particularly in Ría de Arousa. The plans of Ria de Vivero, Ria de Cedeira and Rias de Ares and Betanzos have been removed (all are covered on chart C43), as has the sketch plan of Póvoa de Varzim. New plans of Cabo de Cruz, Vilagarcía and Illa de Arousa to Cambados have been added to provide larger-scale coverage within Ría de Arousa, and a new plan of the Approaches to Ría Arousa has been added. The plan of Ría de Vigo has been enlarged and a new plan of Baiona added. Finally, in order to show detailed approaches to the new Douro Marina, a new plan of Barra do Rio Douro has been included.